Getting higher chip volume with trochoidal and plunge milling. Rigid tapping has been in use since the 1970’s and, since the mid-1990’s, most commonly used machine tools have had this capability. Trochoidal milling with Siemens CNC. Peck tapping has long been used for the elimination of the long, stringy chips from plastics machining and this was rarely a problem, even on bottom out cycles in tight spaces. However, as this is also the tendency of most stainless and brass alloys, considerable increases in milling times or premature tool wear resulted. Thus, the dilemma for many shops was to favor more parts per hour and live with the excess tool wear or focus on more parts per tool and live with the slower processing times. Even peck tapping requires more cycle programming, one of the many “hidden costs” of this and other machining shortcuts. Today, the new trochoidal and plunge milling strategies, combined with rigid holders and new milling tools on the market currently, enable even low-end machines to achieve considerable chip volume with no loss of speed and performance. When grooves with a high depth of cut are milled, especially on lower powered or lighter weight machines, the depth of the cut or the speed must be dramatically reduced; otherwise the machine becomes overloaded and vibrates excessively. The obvious result is longer machining time and increased costs to manufacture. On shorter runs, this problem becomes very serious for a shop living on a close margin. 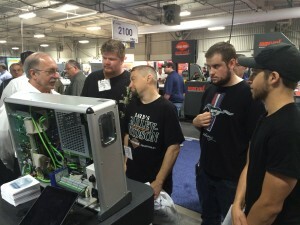 Randy Pearson demonstrates Trochoidal milling with Siemens CNC. milling cutter is combined with a linear feed movement. Therefore, the required groove width is created with a high depth of cut in a slab milling process. Shell endmills with inserts and cylindrical carbide milling cutters are used along with other tools, where the tool diameter is smaller than the groove width being created. The low radial infeed leads to a clear reduction in the tool and machine bearing load. By then increasing the cutting speed and federate, machining becomes more economical than with conventional groove milling. Also, in conventional milling, where one material layer is always removed on every pass, radial forces are mainly applied to the spindle. In the cases of high projection lengths and high shear forces especially, this result in considerable bending motions. If large volumes of material are being removed from thin-walled workpieces, the feedrate and cutting speeds must necessarily be reduced to avoid excessive vibration. 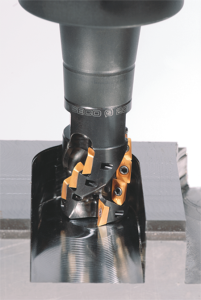 In these cases, plunge milling can be a smart alternative. In this process, machining does not occur at the perimeter of the tool but on the front side instead. Machining is achieved by the offset plunging of the tool. The load is applied vertically on the spindle and workpiece clamping, that is, only in the directions of the greatest machine rigidity. As a result, higher cutting values are achievable, even on lighter machines. An important consideration is the adaptability of your CNC to such conditions. Automatic path generation for trochoidal and plunge milling are typical features on more sophisticated controls, requiring only the entry of a few values on an “open groove” type setting. Previously, CAM systems were needed to accomplish this program. For plunge milling, as with trochoidal milling, the work can be roughing, smoothing an edge or even pre-finishing. Chamfer machining can be used to break the edges after the groove has been milled. Randy Pearson, a longtime veteran of the machine tool industry, is the Siemens sales support manager for U.S. dealers and OEMs. His special interest is the training aspect on CNC machine tools, through the various seminars and classes the company conducts at votech schools and on-site at shops, as well as the Siemens training facilities around the country. If you have questions or comments on this article, Randy can be reached at 1-800-879-8079 or 847-640-1595.